I was up late one night, pacing the floorboards with my infant son, when a strange bark outside drew me to the window. There, in the moonlight and the lamplight, slinking between cars parked on the street, was a silver fox. Except for the single bark, he was silent, his bushy tail high in the air until he slid effortlessly under a car. More recently, we’ve seen foxes trotting across the open meadow near school, a gaggle of geese not far away and ripe for the pickings. When we hear about foxes in our neck of the woods, we immediately think about the hens. Currently, it looks like a fox attacked the hen house as two of the chickie ladies are molting and the feathers are flying. But for us, the fox holds as much mystery as a turkey. Yes, he is intriguing and super cool… but an enigma… not so much. So to answer the question that is consuming our culture right now, a fox barks… maybe not often and certainly not in highly populated places, but he barks. I was first made aware of the craze by our senior pastor who referenced the music video and song “What Does the Fox Say?” Of course, being a good little church-goer who listens to her pastor’s sermons, I went home and googled it. And of course, the minute the music started, my little guy came running. He has the ears of a fox. And he was smitten at first look-see. I have to admit, it is catchy and funny in a hokey kind of way. He was still singing it when sis got home and when she heard him singing she dissolved in agony. “No!” she cried. “Everyone at school is singing that stupid song. I can’t stand it! Please stop!” It was mildly funny. On the way to school this morning, little guy started up again… “What does the fox say?” And then sis says, “Have you seen the video or something?” Yep. And immediately, “Mom, can I have your phone?” Now, I’ve seen the video several times with little man and have ascertained for myself that it is harmless… no twerking or other inappropriate gestures or costumes so sure… I give her the phone. With a speed I can only aspire to, she navigates her way to the Youtube video and soon the electronic notes are flooding my car. Simultaneously, I realize that one of my favorite songs is on the radio, In Christ Alone, this time sung by Owl City. As the pumping, beating quandary about foxes amplified the back seat, the lyrical refrain that tells the story of Christ’s death, resurrection, and what that means for us peaked through. “No guilt in life, no fear in death… This is the power of Christ in me” interspersed with “How will you communicate with that ho-o-o-o-orse?” “Til He returns or calls me home… Here in the power of Christ I’ll stand” punctuated by “ding a ding” and other nonsense sounds. I’m not a pastor’s kid for nothing. The idea that anything can be a sermon topic is self-evident in my experience. And here I was staring a sermon topic square in the face. Wasn’t it just yesterday in Bible study we were talking about being still and hearing God in those still moments, being present with Him so that He could speak to us? Wasn’t it just yesterday when, frustrated at my own inability to fix a problem that God has assured me repeatedly that He has firmly in His hands and while spinning my undies into a giant bunch over certain roadblocks to my being able to fix the situation, God used music to get my attention? Wasn’t it yesterday that He reminded me through song that He’s got this and I can leave the problem in His hands for good? Yeah. And this morning, He showed me vividly how the world clamors for our attention in loud, silly, inane, gyrating ways, in flashy, hokey, well-costumed ways. But under it all, He sings His song over our lives. We can turn aside and look and bop our way to the world, or we can continue to listen, through the noise, to sing along when we hear the words of God. Or we can turn off the world. There’s my conflict. Biblically, it is both right to be of the world and yet to be set apart from the world. Jesus was both in the middle of the muddle with the sinners and yet truly godly and set apart. I’m not Jesus. Good heavens, no. So the balance between being of the world and ding-a-dinging with the best of them and being set apart, standing in the power of Christ is a tricky balance, one I’ll have to continue to perfect. Interestingly, little guy might have hit on the perfect summation of the world vs. heavenly things dilemma. Last night, as I was tucking him into bed, he uttered, “Mama, God knows what the fox says, cuz He made the fox.” There ya go! “I could hear you over everyone else.” This sentence followed by an eye roll so big he could have seen his brain stopped my joy. I was 8ish, in children’s church choir, and I loved to sing. That service, we sang from the balcony. Our director had emphasized the need to sing out. I took her at her word. And down below, Robbie composed his zinger. The one that corked my voice. And several years later, in college, Beth asked me why I only sang one note while singing hymns in church. There was something in her tone that meant even that note was way off. And the cork, well, it wedged in there tighter. But sometimes corks decay. Sometimes they crumble. My daughter told me the other day that I have a lovely singing voice. I was in the driver’s seat; she was behind me in the back seat. She may have seen my face in the rearview mirror. I hope not. It was hard to accept the praise. Those other two voices rang in my mind as truer than my daughter’s. Why do we find it so easy to hear the negative? Why do we cling to things that rob us of our joy? Why do we turn away from appreciation and love? Why is so much easier to believe the put down than the praise? Nevertheless, I sing. Bill taught me to “make a joyful noise unto the Lord” – no matter what those around you say. God loves your voice when you use it to praise Him. There are times when one has to sing… when even if one didn’t, even the rocks would sing out… it is that imperative. So, I sing. Against the negative voices, beating them back with disdain for their hollowness, for their attempts at inflicting pain. I sing praises, encouragement, psalms, happy little ditties, prayers of longing, need, reminders of God’s presence. Like my dad who sang everywhere he went. You could locate him in the church by simply following the sound of his hymn singing. Oh sometimes he would break into “mares eat oats and little lambs eat ivy,” but most of the time he was singing the sacred… a thread of notes reflecting the rope that held him to his anchor. Like the lady at kindergarten pick-up who plays opera on her phone as she walks the line… and sings along. We moms stand mute in the face of that kind of … oh I don’t know what to call it… composure, confidence, unconcern for our opinion, joy. Like my daughter… now… who “just loves to sing.” And her voice filling the car or the kitchen or the shower is a true delight, something to tuck away in the corners of my heart, to anticipate and encourage, because singing itself brings joy and release and it reveals the heart. Like the kiddos at 1000 Hills Community Helpers singing their morning prayers or the grannies there singing and dancing their joy in community, the relief they find at the center, their praises for a God who loves them or the workers celebrating over packages of Compassion Tea, spontaneously creating a jingle. Oh sing out people! The imperative is clear. 1 Chronicles 16:23 Sing to the Lord, all the earth; proclaim his salvation day after day. Psalm 13:6 I will sing the Lord’s praise, for he has been good to me. Psalm 33:1 Sing joyfully to the Lord, you righteous; it is fitting for the upright to praise him. Psalm 104:33 I will sing to the Lord all my life; I will sing praise to my God as long as I live. Psalm 135:3 Praise the Lord, for the Lord is good; sing praise to his name, for that is pleasant. Jeremiah 20:13 Sing to the Lord! Give praise to the Lord! He rescues the life of the needy from the hands of the wicked. And then there’s this… number 8 ! So, sing it! Sing your opera, sing your hymns, sing your life. And you know what, God’s singing over your life. There’s a mountain of clothes in my laundry room right now. Wet non-dryables hang on the rack while the darks sit in the washing machine. Piles of whites and colors wait their turn. When they are clean and dry, there won’t be any baskets to put them in because last week’s clothes haven’t yet made it into the drawers and closets where they belong. And yet, I need to talk about Kingdom work. I need to talk about the enormous need. I need to talk about global problems with no simple solution and about individuals trapped by war, displaced by famine, orphaned by disease, abused by the cycles of government ineptitude or corruption or pure evil. We can wring our hands, we can succumb to despair, we can turn a blind eye because we don’t have the solution. But we miss the opportunity to speak love into one life. Because that’s how God’s work is done… bit by bit, person by person… one cup of tea, one blood pressure cuff, one load of laundry at a time. Lisa-Jo Baker, blogger mommy activist, launched a campaign today to build a place for mommies in Africa to do their laundry. She writes: “Today I want to invite you to do virtual laundry together. Help One Now and the local South African organizations that my parents work with, Take Action and the James 127 Trust have the architectural plans and the permission to build a community water point. It’s designed with moms in mind. To make laundry days easier and bringing home water for cooking and drinking simpler. • Consistent: because it will include a water storage tank so that even if water supply is interrupted, there will always be back up water. • Convenient: the water point will include clothes washing troughs – to make doing laundry easier. • Community friendly: there will be benches to sit and wait for a turn to wash clothes or gather water. • And offer food security: because it will be the water supply for a future vegetable garden. And because the Internet can build a virtual bridge between here and South Africa moms the world over can offer to share a laundry day together. We all get being buried under piles of kids’ clothes and the knowledge that what we washed today will be dirty again tomorrow. Let’s do virtual laundry together. Let’s build a water point and laundry facility for our sisters and their kids in South Africa. I encourage you to go to the website and check it out. She has fabulous photos of the current water source, a hose coming out of the ground, surrounded by mud. And while sometimes I’m quite sure the water coming out of my washing machine must in fact resemble a mud bath, I can’t imagine washing my clothes in mud. And I’ve heard mommies talk about using laundry as a way to praise God. To use the time folding as a time of prayer… praying over the individuals who will wear, dirty, stain, split seams of the very clothing I’m folding. Do it all, even the menial, for the glory of God. Bit by bit, sock by sock, we get it done… the kingdom work. Laundry is hardly the extent of it though. Water in Africa is scarce. 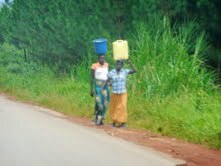 People sell water to make money. Wendy, who just returned from Zambia, South Africa, and Uganda, explained that her sponsored child, Scovia, a 14 year old Ugandan, walks one half km each way for water for her family. She carries it on her head. Scovia walks another 3 km each way to school. What water her family doesn’t use, they sell. 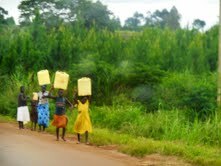 From childhood, from the moment a child can walk well, he or she is expected to carry water, even in a small jerrycan. The distances are long, the water itself may be contaminated, and there is only so much to go around. 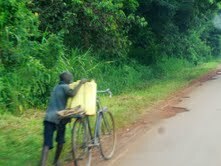 The same water that is used for laundry is often used for bathing and then transported home for cooking and drinking. 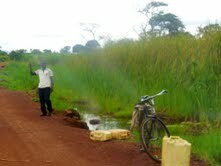 Gathering water by the side of the road. Frequently, animals use this same water for drinking, bathing, and as a toilet. It’s not easy to be healthy when this is your drinking water. Bit by bit, sock by sock, cup of tea by cup of tea, blood pressure cuff by blood pressure cuff, person by person, we make strides, we tackle the big stuff. Have you ever watched ants move house? They don’t just take the whole thing and lift it up and move it. They each take a part, …a morsel of food, a larvae, a clump of dirt… and they move it bit by bit. 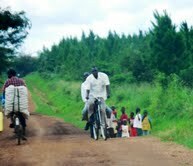 A family heads to the water hole to do the laundry. 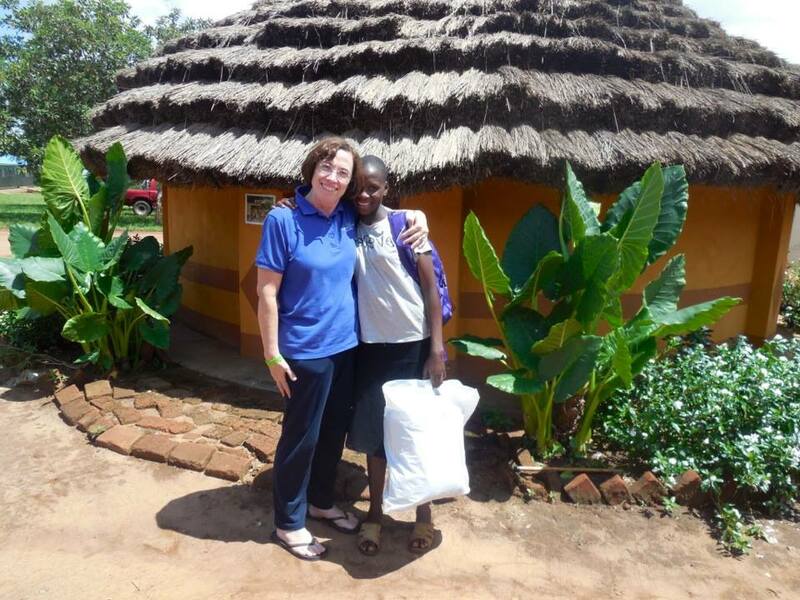 Through the bravery of mommies building a laundry facility for neighbors in Africa, through the bravery of compassionate folks supporting CompassioNow, through the bravery of tea-lovers buying tea for a cause, we can move house like the ants. Bit by bit. It takes us all, acting in small ways, NOW. Now, back to my laundry. Write the right stuff. But what is the right stuff to write? Right what I feel? Right God’s truth revealing itself in the onion layers of my days? That is always right, but is it what I write? There is soul undiscovered if I write right. There are rooms to unlock, lands to explore if I write right. But it takes hours to find the right key, to find the right lock, to find the creatures that bar my entrance, and to find the right way to slay them. Hours I can’t find right now. So, I write the surface. And that is right, now, because their stories are right and need to be told. Please read more! Throwback Thursday… let’s take a look back! 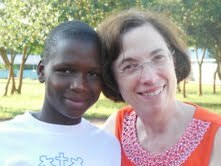 (And remember, we’ve changed the name… CompassioNow (www.compassionow.org) used to by the Care Now Foundation. On Sunday, when I picked Joseph up from his Sunday School class, he was carrying a blue piece of paper on which he had glued a picture of two boys in karate uniforms. An adult had written, “Who is your neighbor?” After discussing what he had played during Sunday School (superheroes, of course), I asked him, “Well, who is your neighbor?” I fully expected some kind of shallow yet adorable four year old response indicative of his world view, a comment that would make me laugh and I would post on Facebook for its cuteness. What I heard was far better. “Everyone is my neighbor, Mommy.” Everyone.